The R-300 features 300 daylight-balanced LEDs that produce 1950 Lux @ 1-meter. An onboard dimmer offers seamless power variation from 0-100%. It has two power options: a Sony NP-F Battery Plate and a DC 2.5 jack (DV Battery and AC Adapter sold separately). The R-300 has a 65˚ beam-angle allowing for an wide, even spread of light. It is slim in profile and light in weight making it a perfect companion for shoots in the studio or on location. The R-300 is perfect for glamour, concert, and macro photography/videography. The R-300 comes packaged with two magnetic filters: a Tungsten Filter and a Frost Diffusion Filter. The Tungsten Filter will calibrate your light to 3200K allowing you to shoot indoors under incandescent light. The Frost Diffusion Filter takes the edge off of the light’s beam and also can serve as a gel holder. Also available, is the NEW Milk White Diffusion filter which creates a very soft, glamorous, and easy-to-look-at light source. 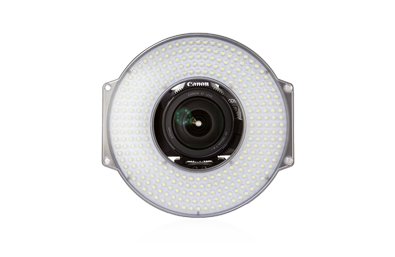 The R-300 Ring Light comes packaged with an L-bracket. The L-bracket has a 1/4″-20 thumb screw that allows you to mount your camera for mobile use with the R-300 system. The bracket also has a 5/8″ female receptacle. For hand held shooting the 5/8″ female receptacle can also accept a hand grip to allow for a mobile, compact shooting solution. The 5/8″ receptacle also allows you to use the light off-camera and mount the Ring Light directly onto a light stand. The R-300 Ring Light is more than just an on camera light; multiple units are easy to travel with, and can serve as a complete lighting kit.